From pages of the Eisner Award-winning graphic novel BATMAN: THE KILLING JOKE, acclaimed artist Brian Bolland's iconic rendition of The Joker gets a seven-inch polyresin Designer Series mini statue. 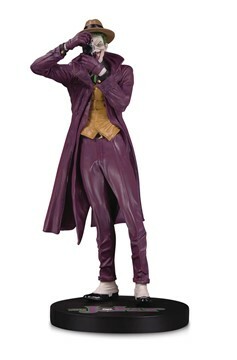 Limited Edition of 5,000, this statue sculpted by David Giraud brings to life one of the most seminal interpretations of the Clown Prince of Crime to ever come to comics. DC DESIGNER SERIES statues are based on art from the comic industry's top creators and recreates their vision in vivid 3D detail. Limited Edition of 5,000 • Measures Approximately 7.37' Tall..